On the high end, FastMac has the first Blu-ray upgrade for MacBooks and PowerBooks. Just $800. On the low end, Addonics has released a pair of adapters that will let you replace a 2.5" IDE laptop drive with one or two Compact Flash (CF) cards, bringing solid state booting to a host of older notebook computers such as the PowerBook 150, 1400, 5300, WallStreet, and clamshell iBook. We're hoping to obtain a review unit. For those who need speed and capacity, the new 7200 rpm 160 GB hard drives should be a popular option, albeit a bit on the costly side. "Sure, you may think I'm crazy, but hear me out before you shoot me down. 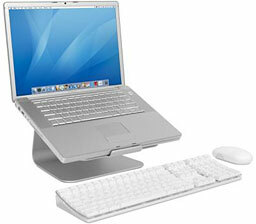 The iBook G4 was my first Apple notebook, and thus the one that holds the greatest place in my heart. It was small, could handle a surprising amount of processes (even the likes of Final Cut Pro), and had sleek looks with a durable casing. After MW06, I couldn't wait to get my hands on a shiny new Intel Mac, and so ended up buying a MacBook Pro with the funds made from the sale of my iBook and Power Mac G5. "My MacBook Pro served me well. It was by far one of the most powerful machines I'd ever owned, even giving the G5 a run for its money . . . I loved the look of the aluminum casing and the thin design, but ultimately decided to move on to smaller-and-better things. "Last week, after listing my my brand new MacBook Pro on eBay (Apple sent me a new replacement unit after my old MBP malfunctioned), I walked home with a shiny white MacBook. Since the day when my new system was up and running, I have never looked back; I absolutely love this little machine." "Seagate Technology has announced that it is now shipping its Momentus 5400 FDE.2, an encrypting 2.5in hard drive for notebooks, to ASI Computer Technologies. The Momentus 5400 FDE.2 (Full Disc Encryption) hard drive offers up to 160 GB of capacity, Serial ATA interface, and hardware-based AES encryption. "The encrypting hard drive is also positioned as a means by which organizations can easily repurpose or retire laptops without compromising sensitive information and comply with data privacy laws." "If the battery is removed from a MacBook or MacBook Pro, the computer will automatically reduce the processor speed. This prevents the computer from shutting down if it demands more power than the A/C adaptor alone can provide. "Important: It is strongly recommended that you do not use your MacBook or MacBook Pro while the battery is removed. Accidentally bumping the A/C adaptor could disconnect power and shutdown the computer. Any information that was not saved on your computer would be lost." PR: This family of unique CF-IDE hard drive adapters is designed to enable one or two Compact Flash (CFI/II) media to be used as direct replacement for the 2.5" IDE hard drive. As a result, any equipment, such as Notebook computer, that uses a 2.5" IDE hard drive can be easily converted to use the low power and shock resistant CF media. Once installed, the CF appears as an ordinary hard drive to any OS and can be configured as a boot device. 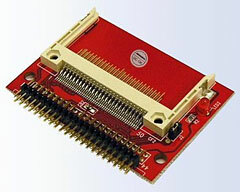 The Dual CF-IDE Hard Drive Adapter contains a second CF slot for the slave position of the IDE channel, allowing increased storage capacity with the same low power consumption and solid state benefits of the CF card. 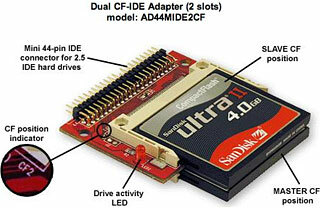 Supports DMA and Ultra DMA modes (only on flash media card with such features). 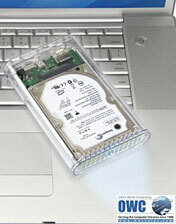 Editor's note: The next hot thing in notebook computers is using flash memory instead of a hard drive. This adapter lets you use a Compact Flash (CF) card (or two) to replace the hard drive in an existing laptop computer. CF cards are available in capacities as large as 16 GB, although those are very expensive. 8 GB CF cards are currently available from $78 shipped. Although small by today's hard drive standards, this could be a great way to update an older PowerBook such as a 150, 190, 190cs, 1400, 2300, 2400, 3400, 5300, G3 "Kanga", G3 "WallStreet", or clamshell iBook. This will make the computer lighter, increase battery life, and may result in faster startup and file access. PR: FastMac has announced the first & only Blu-ray optical drive upgrade for Apple's PowerBook, iBook & MacBook Pro computers. The new slimline, slot loading drive uses one of the fastest & most compatible Blu-ray mechanisms to provide up to 50 GB of storage on 1 disk, without sacrificing compatibility with standard DVD & CD recordable media. FastMac's Blu-ray optical drive upgrade is scheduled to ship within 10 days and is available for pre-order from FastMac for a special introductory price of $799.95. Each drive carries a 1 year warranty and a 30 day money back guarantee . "This new optical drive gives me the freedom to save anything, anywhere I happen to be with my new MacBook Pro," said Edward Savio, President of FastMac Performance Upgrades, Inc. "With this much storage capability, I was able to sort and backup my work on a per project basis." Blu-ray, also known as Blu-ray Disk (BD), is the name of a next generation optical disk format developed by a consortium of electronics and computer manufacturers including Apple, Dell, HP, JVC, Mitsubishi, Panasonic, Pioneer, Philips, Samsung, Sharp, Sony & TDK. The format was designed to enable the recording and playback of High Definition (HD) content and to allow storage of large amounts (up to 200 GB) of data. While current optical drive technologies rely on a red laser to read and write data, the new format uses a blue-violet laser (hence the name, Blu-ray). The blue-violet laser has a 38% shorter wavelength (405nm) than a red laser (650nm), allowing the drive's optical pickup unit to focus more precisely than ever before. Data can then be packed more densely on standard sized disks. Despite using a new type of laser, Blu-ray drives are compatible with standard DVD and CD media through the use of a combined red, blue & violet optical reader and writer. In addition to broad support from the electronics, music, computer & video game industry, 7 out of 8 of the major Hollywood film studios support Blu-ray media and 5 out of those 7 (Disney, Fox, Lionsgate, MGM & Sony) have decided to release their movies exclusively in the Blu-ray format. With its forward and backward integration with new and old media, Blu-ray is destined to become the successor to today's DVD format. FastMac's slimline Blu-ray slot loading optical drive supports reading, writing and rewriting to single and dual layer Blu-ray media at 1x speeds. The drive is also compatible with standard DVD and CD media and can write to DVD-R and DVD+R media at 8x speed in single layer and 2x speed in dual/ double layer mode. It can rewrite to DVD-R and DVD+R media at 4x speeds. The drive also supports DVD-RAM reading and writing at up to 5x speeds and standard CD-R and CD-RW burning at 8x speeds. PR: Other World Computing (OWC) has announced the highest capacity, fastest portable storage drive solution on the market - the OWC 160 GB Mercury On-the-Go portable hard drive. Equipped with FireWire 800/400 and USB 2.0 interfaces, the OWC Mercury On-the-Go 160 GB 7200 RPM is a palm-sized, bus powered, high performance storage solution offering a full 60% greater capacity than the next available 7200 RPM capacity in the market of only 100 GB. Priced at $279.99, the powerful OWC Mercury On-the-Go 160 GB 7200 RPM model is geared towards the demanding "On-the-Go" professional, who requires dependable, high-performance storage. The "fits in your shirt pocket" portable drive is compatible with virtually all computers with an available FireWire or USB port, including all Macs and PCs. It also works with all FireWire or USB gadgets, including digital cameras and camcorders, for an instant On-the-Go portable storage solution to quickly and safely store all your digital photos and video when traveling. Take your computer on the road! Back-up your desktop computer and bring it with you everywhere you go with the Mercury On-the-Go portable drive. For added convenience when backing up, the portable drive also includes the full retail versions of the latest award-winning Prosoft DataRescue III for OS X (just released last week) and NovaStor NovaBackup for Windows. "OWC has been a leader in portable storage solutions for over half a decade," said Larry O'Connor, CEO, OWC. "We understand the need for reliable, high-performance, high-capacity portable solutions, with our Mercury On-the-Go series filling that need quite nicely. Whether it's taking work between the office and home, or needing that extra capacity when you're traveling 30,000 feet up, these solutions truly let you get it done On-the-Go." The OWC 160 GB Mercury On-the-Go Portable Drive is immediately available and shipping at $279.99 through OWC and other retailers. It has two FireWire 800/400 and one USB 2.0/1.1 ports and ships with carrying case, FireWire 400, and FireWire 800 cables, USB cable, Prosoft DataRescue III for OS X and NovaStor NovaBackup for Windows. It is covered by a one-year warranty and is compatible with Apple OS Versions 8.5 through 9.2.x; Apple OS X 10.0.3 and higher (including OS X 10.4.x); and Microsoft Windows 98SE, ME, 2000, XP. PR: Rain Design Inc., creator of designer accessories for Apple products, announced today the release of mStand, the newest addition to its line of innovative laptop stands. mStand raises laptops for better ergonomics with a design that flirts with Apple's desktop computers. Designed for the Apple MacBook and MacBook Pro, suitable for all laptops, mStand helps you work comfortably and safely every day by raising your laptop to the same ergonomic height as the external display. 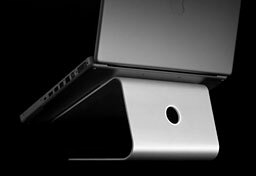 mStand is made of a single solid piece of aluminum with matching MacBook Pro's sandblasted and silver anodized finish. mStand transforms your laptop into a stable and stylish workstation. Made of a single sturdy piece of aluminum, mStand transforms laptops into stunning desktop counterparts of the Apple iMac and Apple Cinema Display with its elegant curves and silver-anodized finish. The single piece design solidly holds a laptop while the aluminum panel acts as a heat sink to keep the laptop cool. A cable hole in the back of the stand routes wires to reduce clutter. Long-term use of a laptop as the main computing device can strain the body as the user hunches down to see the screen and type. 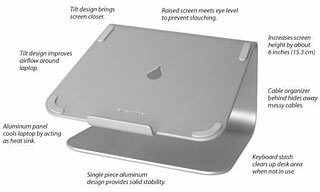 mStand raises the screen 5.9 inches (150 mm) to meet the user's eye level, thus promoting better posture, while its tilt design brings the screen closer for easier viewing. With an external keyboard and mouse, mStand creates an ideal ergonomic desktop setup for laptop users. Rain Design's mStand accommodates all Apple laptops and other laptops with depths less than 10.4 inches (265 mm). Available at mstand.html and computer retailers for a suggested retail price of $49.90. Adhesive technology by 3M prevents bubbles and allows easy application and clean removal. Every GelaSkin for the iPod includes a screen protector to defend the display from scratches and to help hide old scratches. GelaSkins protect your precious portable devices with a durable anti-scratch, anti-UV coating. 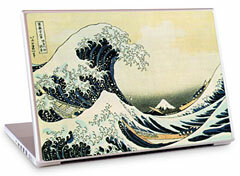 Choose from our extensive gallery of artist-designed skins to turn your iPod or Laptop into a portable canvas. Choose Any 3 GelaSkins from the site and you can pick a 4th for free. 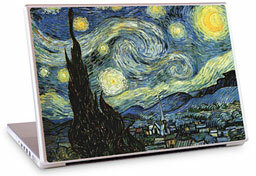 GelaSkins are ultra-low profile for flawless compatibility width laptop cases and iPod accessories. PR: zCover Inc., manufacturer of fashionable silicone protective cases, has announced the release of their zCover TypeOn keyboard Skin for Apple MacBook. Constructed from the zCover's high-quality silicone, zCover TypeOn keyboard protectors mold perfectly to your MacBook keyboard and keep the keyboard clean and smudge free. Being extraordinary durable and a perfect fit, they protect your MacBook keyboard without restricting normal typing and maintaining a clear view of the keyboard. zCover TypeOn keyboard protectors are removed just as easily and can be washed for easy cleaning. zCover silicone skin are crafted from nontoxic, durable high-grade silicone rubber. It is safe. Washable - you can wash zCover silicone TypeOn skin by hand. Make sure it's dried out before put it on your keyboard. Dry it in room temperature. Please avoid direct fire and direct bright sunshine. 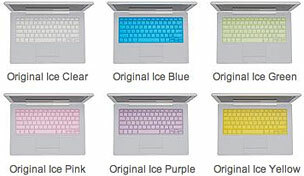 zCover TypeOn Keyboard Skin for Apple MacBook comes in a variety of colors: ice clear, ice blue, ice green , ice pink, ice purple and ice yellow. 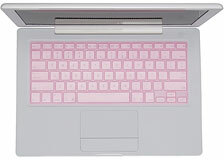 zCover TypeOn Keyboard Skin for Apple MacBook retails for $24.95. PR: San Francisco Design says: "Waterfield bags are designed and made in San Francisco, where the rent is high, labor expensive, and competition is intense. We wouldn't go anywhere else." Those willing to pay just a bit more will be rewarded by the Waterfield combination of thoughtful design, tasteful styling, fine workmanship, and top-grade materials, and by spending a bit of time on the Waterfield website you can choose the perfect bag for your needs and tastes from among the extensive range of models and sizes offered. Waterfield has just released a brand new computer bag, the Sling, and it may be their most classy effort yet in a very strong field. The Sling is all-in-one bag that can carry just about everything. 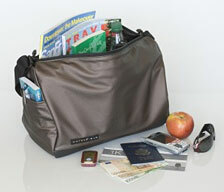 With a roomy interior and multiple zippered pockets, travelers can stow last-minute purchases and use as a carryon. Commuters can throw in their work gear, lunch & the daily paper. Exercise fiends can fit all their gym gear for daily workouts. Parents can stash bottles, diapers, and toys (and, it's machine washable!). 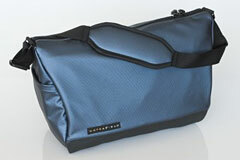 As with all Waterfield products, this bag is as beautifully finished inside as it is outside. Optional: Matching Gear Pouch. Color-coordinated gear bags are available to organize other personal items. Large Sling $139 / 17" x 14" x 10 " / 1.9 lb. Medium Sling $129 / 15" x 11" x 8 " / 1.4 lb. Small Sling $99 / 12 " x 8 " x 5 " / 1 lb. PR: Battery Health Monitor is a free utility for PowerBook and iBook owners that monitors virtual all battery health parameters and displays them in an easy-to-read format. Original capacity is an indication of the battery's storage when it was new. Current capacity indicates how much that original capacity has changed with use. Current charge shows the battery's current charge state while Charge Cycles indicates how many complete charge/discharge cycles the battery has experienced. The percentage value indicates approximately what portion of the number of total recharge cycles the battery supports have been used. The annunciators at the top of the window indicate the state of the computer's power manager circuit and the battery or batteries installed. Reduced processor loading for PowerPC G3 and G4 Macs. Corrected a problem with the "Battery Life Remaining" graph. requires Mac OS X (10.1 or later).